HUMACAO, Puerto Rico — The world-renowned resort community here is a ghost town. No one sits by the three-tiered pool even though it's high tourist season. At the area's largest hospital, four of the five floors are closed. Long lines still form for ice and water. Livelihoods have disappeared. "No hay luz" (there is no power) is a repeated refrain from almost everyone. 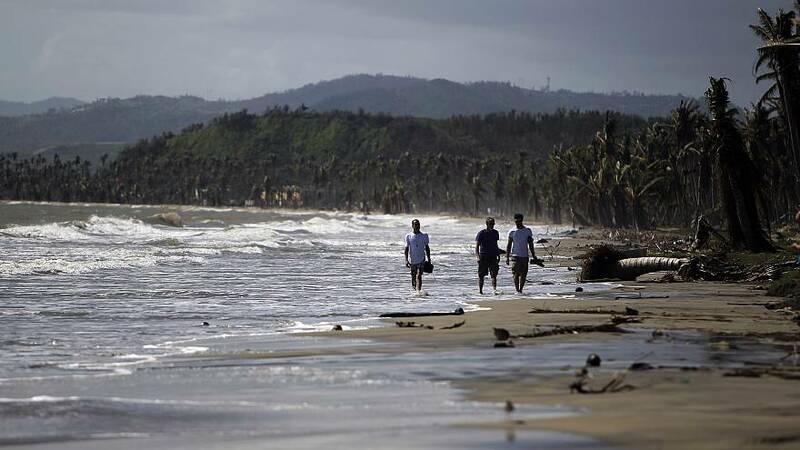 It has been three months since Hurricane Maria entered Puerto Rico like a battering ram through Humacao, sweeping through this southeastern coastal city and into the island's history as its worst natural disaster. But the catastrophe continues. Still largely without electricity and clean water, people who withstood the hurricane's force feel abandoned and question whether the U.S. government cares about their survival. Just about 45 minutes from the capital of San Juan — longer with the heavy traffic now on the main highway — Humacao used to draw tourists and Puerto Rican vacationers every year. Charter yachts took passengers through the warm waters to the smaller Puerto Rico island of Vieques. It is known for the world-class golf course at the Palmas del Mar resort and its pharmaceutical and medical supplies industry. But as of mid-December, the U.S.-based pharmaceutical giant Bristol-Myers Squibb — which manufactures cardiovascular and anti-diabetes products and employs about 300 people — was still running on generators. More than half of the city's schools were closed, along with an untold number of businesses, including Humacao's major shopping center, which housed Walmart, J.C. Penney, Marshall's and the local Capri department store, among others. "We are still in Maria. Maria has not left Humacao," said Jahaira Paris, owner of a local drugstore, Farmacia Central, in Humacao's city center. Although her business is operating on generators and seeing a spike in sales because the big shopping center is closed, she waits for electricity at home and only recently got running water. This area has been the last to receive help, has been the area that help has come to the slowest, even though it's where Maria got its start, said Puerto Rico Sen. José Dalmau Santiago. Right after the hurricane, there were no images from Humacao of mudslides and bridge collapses and refugee camps as in other communities, so "they looked here too late," he said. Dalmau, former president of the Senate Health Committee, worries about the effect of this limbo on the city's pharmaceutical industry and the jobs it provides. "It is a profound problem and I'm not sure if the government knows the magnitude of it," Dalmau said. The endless delay in providing power to the city is the result of several factors, including bureaucratic stumbling over the restoration to a long-outdated electrical grid run by a bankrupt power company that is $9 billion in debt. The Army Corps of Engineers considers Humacao "ground zero" for the force of the hurricane, which left the power grid destroyed and in need of a complete rebuild, according to Jay Field, public affairs officer for the Corps' power restoration task force. Other cities that weren't as affected are in better shape than Humacao, where finding open gasoline stations is still a guessing game each day and the phone signal is erratic. With factories and businesses not fully up and running because there is no electricity, workers' income and business and tax revenue are being lost. Buying staples like clothing requires going to San Juan or other towns. "Humacao wasn't like that," Paris said. "Humacao had everything." For many residents, life has been reduced to getting through each day, working to ensure there's enough water, ice, gasoline, oil and food. Without electricity, the pumping stations that clean the water don't work, and unrefrigerated food quickly spoils. The stress of that daily scramble has sent hundreds of thousands fleeing the island, largely to Florida. Puerto Ricans sticking it out wonder how long they can last, particularly given the predictions that it could be months, even a year, before Humacao is fully on the grid. It's a prospect Paris doesn't want to endure. "I'm desperate," she said. If it takes that long, "I think I'd also get on a plane." The violent storm ripped the livelihoods from Jose Torres and others who belong to the Asociación de Pescadores Unidos (the United Fishermen's Association) de Punta Santiago. The group of 16 plucked fish daily from the island's waters and sold them to local restaurants. But Hurricane Maria destroyed some of their boats and the fish seem to have scattered. "This is octopus season and I see none. They have left the area," Torres said, pointing to two small bags of lobsters caught that day. "Like all Puerto Ricans, it's changed our lives radically," he said. "The suffering, the pain, the loss of how to make a daily wage." Torres knows it will take time for the sea to recover. With the rest of the city ailing, there are few jobs, so there is desperation, Torres said. "This is so slow and the damage is great," Torres said. "In eight months, we'll be right back in hurricane season. It would be so sad for that time to come and for us to go through something like that again. This would practically turn into a deserted island." On Sept. 20, when Maria pounded its way into Humacao, Torres awoke to the sound of screams from his daughter and granddaughter. They were clinging to a fence gate behind their home in rushing floodwaters. Torres managed to pull them inside to safety, but nearly being sucked into Maria's viciousness has left them shaken. The memory of the disaster is impossible to ignore, particularly in areas of Punta Santiago, a community in the northeast corner of the Humacao municipality, where debris and destroyed belongings still sit in streets and many people, including Torres, line up to receive basic necessities at churches and a nonprofit. "Many don't want to admit it, but you've lost everything in less than 12 hours. You can still see it with your own eyes, that you've lost everything," Torres said. "Everyone is traumatized." The Federal Emergency Management Agency has distributed nearly 2,500 tarps in the Humacao municipality — the area that encompasses the city of Humacao and nine "wards" or communities. It's also given out about $15 million in grants that don't have to be repaid and $1.1 million to the city, according to FEMA spokesman Daniel Llargués. But those are stopgap fixes. Humacao can't really get back on its feet until there is electricity. Humacao's residents, and essentially everyone without power in Puerto Rico, are at the mercy of an electrical system that was known to be frail, decrepit, mismanaged and broke long before Hurricane Maria hit. The island got a preview of things to come when Hurricane Irma sideswiped Puerto Rico on Sept. 6 and left 1 million without power. Even before Irma, island power outages were frequent. Weeks before Hurricane Maria ravaged Puerto Rico, Ricardo Ramos, the former head of the Puerto Rico Electrical Authority, PREPA, doubted the electrical grid could withstand a major storm and told Caribbean Business that the lifespan of most of PREPA's equipment had expired. If a large "atmospheric event" hit Puerto Rico, it would "wreak havoc because we are talking about a very vulnerable and fragile system at the moment," Ramos said. He predicted power would be out for weeks, underestimating the coming catastrophe. Hurricane Maria has revealed that PREPA does not have the poles, wires and other equipment to repair its electrical grid. Brigades of electrical crews can be seen in Puerto Rico, but their work can't progress until they have the parts to put everything back together. For example, as of Dec. 15, the island needed 52,480 poles. It had 6,228 as of that date with another 8,500 to arrive over two weeks, Caribbean Business reported. Also, 17 million conductors, which carry the electrical charge, are needed, but just 347,000 were on the island. Workers had 7,639 insulators of 184,750 needed, the news outlet reported. "You can have all the brigades in the world, but if you don't have the equipment and material, nothing gets done," said Philipe Schoene Roura, executive editor of Caribbean Business. There has been some movement in getting some power to the island. The Puerto Rico government jettisoned a highly controversial $300 million contract with Whitefish Energy, a company considered inadequate for the job. The island's governor, Ricardo Rosselló, has requested help from utilities in the U.S., which has brought in workers and crews. Mega-generators are powering some parts of the island. Michael Hyland, vice president of the American Public Power Association, an industry group, said PREPA divided the country into seven regions. Teams under supervision of a "storm boss" hired by the utility industry are taking stock of what is needed by region and ordering supplies from the mainland. "I think you are going to see a steady increase (of supplies) in the next three weeks," Hyland said. Getting enough equipment is itself a dilemma. With Texas and Florida also recovering from hurricanes, and California still suffering from wildfires, there is a shortage of the poles, cable transformers, fuses, towers and insulators that are needed, Field said in an email. Meanwhile, the Army Corps is installing "microgrids," which can operate without a connection to the main grid, in communities in the Humacao municipality. The microgrids are meant to provide power in areas where the grid is not expected to be energized in the near future, Field said. Puerto Rico's flimsy electrical system is "the result of decades, decades, decades of mismanagement, of treating PREPA as a cash cow by whomever was ruling the roost at the time, making decisions that were practically criminal," said Mike Soto-Class, co-founder and president of the Center for a New Economy, a San Juan-based non-partisan think tank. "Now we are caught face-to-face with the reality of what that meant," he said. For Maria Martinez, 68, who lives in Punta Santiago, it has meant sleeping every night at her son's house, where she feels more secure even though there is no electricity and the water comes from a well that her son dug. She returns daily to her home, where she waits for FEMA officials to assess her losses. "The rain came in. I lost my bed, another bed, everything in the living room," Martinez said, crying as she recalled seeing her home for the first time after the hurricane. "Now at night, with no lights, it is not secure for me. I feel sad. The depression is still hard." The hurricane came in with tornadoes and "whirlwinds" when it entered at Humacao and madelandfall at nearbyYabucoa. Its fierce torrent turned Hospital Ryder-Humacao's metal roof into a colander. There were 79 patients at the 173-bed hospital at the time, a lot during a hurricane, said José Feliciano Sepulveda, the hospital's executive director. Then came several more days of rain. "We had to move patients from one floor to another as one floor would get filled with water and we couldn't control it," Feliciano said. Then the only power source, an emergency generator, failed, forcing the hospital to evacuate patients, including six in intensive care. Five went by helicopter to the USNS Comfort, the Naval hospital ship that had arrived at San Juan that day. Until the start of December, the hospital was forced to operate on generator power and had to turn away non-emergency patients, including women who had gone into labor, but had time to get to another hospital. Electricity returned to the hospital at the start of December, but was unstable in its first week, creating teeth-clenching days of hope that it stayed on in critical times. Beyond the millions of dollars in damage, "many doctors have left because they don't have work now, especially surgeons," Feliciano said. Hospital officials hope to open a couple more floors by the end of the year, get working again and maybe lure back some doctors. But many people need more help than doctors can provide, Feliciano said. "I think the elderly are suffering a lot from this and maybe they'll last some time, but if things don't get solved immediately the depression can kill them," he said. The lack of power, especially at the hospital, "es lo que me quita el sueño" - it's what keeps me up at night, said Dalmau, before ticking off the deaths he attributes to hospitals being off the grid. A woman in Caguas in frail health had a routine knee operation as Hurricane Maria was closing in, but died in recovery when the generators failed, he said. The oxygen machine of the mother of a friend of Dalmau's failed when the electricity went out at the nursing home where she was staying and she died. A 70-year-old friend of his father, who had emphysema, decided not to go to the hospital when he had breathing problems because the hospital lacked power. That decision proved fatal, Dalmau said. The official death toll from Hurricane Maria is 64, far more than the 16 cited by President Donald Trump, who said Puerto Rico should be proud the number was so low. But the toll of 64 deaths is itself believed to be far too low. A recent estimate by The New York Times suggested the real number may be more than 1,000. On Dec. 18, Rosselló acknowledged for the first time that hurricane deaths may be higher than the official toll. He has ordered a review of all deaths since Maria. As long as there is no power, the Puerto Rican death toll could continue to rise. José Oquendo Cruz, executive director of the area's largest non-profit helping the disadvantaged, P.E.C.E.S., said a cousin rode his bike to his nephew's home to break the boredom of being in his home without power. Riding in the dark in Punta Santiago with no electricity to power streetlights, the cousin was hit and killed by a car whose driver fled. "So the question is, is this a consequence of Maria?" Oquendo asked. "I would answer, obviously yes, because there's no power and without power, crime goes up and there's no civic responsibility. The number of deaths that the government is reporting is not (correct). There are many more." Along Humacao's roadways, there are signs that some city residents are finding a bit of firmer footing: Diners sit at stools on the patios of reopened chinchorros, the local roadside eateries where visitors and residents stop for beer, Puerto Rican frituras (fritters), music and camaraderie. A few employees from the Bristol-Myers Squibb pharmaceutical plant were out at a local Chili's for lunch recently. There are shorter lines at bank ATM machines in a smaller shopping center and now and again some Christmas lights are glowing. But the appearance of normalcy is an illusion, because many residents say parts of their lives still are in chaos. At Humacao School Supply in the city center, a young girl in a plaid school uniform browses through the aisle. Store owner Wilfredo Rodriguez reopened a week after Maria, thanks to a large generator and a building reinforced after the island was hit in 1998 by Hurricane Georges. But sales at his more than two-decades old business plummeted 50 percent in the first month and now are off 20 percent. At his home at the Palmas del Mar resort, he sees work crews, but not the usual tourists and vacationers. "Humacao is in crisis," Rodriguez said. "The people are trying to get back up, but the crisis is still very much here." In the neighborhood of Punta Santiago, one of the city's poorest areas, people line up in their cars or arrive on bicycle or foot for bags of ice handed out byP.E.C.E.S., the large Humacao non-profit. Later, some may head a few blocks up the street toNuestra Señora del Carmen Catholic Church for a free meal or to use the washers and dryers set up there for hurricane victims. In the midst of the disaster, non-governmental organizations, known as NGOs, are taking on an outsized role that is a remarkable shift for Puerto Rico, considering such groups' usually subordinate role to government. Before the hurricane, P.E.C.E.S. largely provided education and social services. After the hurricane, it became a distribution center, helping get donated and government-supplied goods to the community and continuing the work even when officials have said the worst is over. "Every day we have more people coming because other (disaster) centers have closed" Oquendo said. On Dec. 5, P.E.C.E.S. had served 431 people, a day officials considered slow. "The federal government, FEMA, finished and the U.S. Army that was here determined the emergency is over," Oquendo said. "I don't know what it means that the emergency is over ... What happens to the people?" P.E.C.E.S. is now trying to find ways to use this period to make Punta Santiago self-reliant. With a $20,000 grant, it purchased a solar- and wind-powered water filtration system designed by Innovative Water Technologies that can clean 5-6,000 gallons of water daily. In the future, the group wants to bottle and sell the water from the filtration system, create a solar power grid to provide the community with its own power source and overhaul the Punta Santiago drainage system that repeatedly floods. "We have to build back better - in a stronger, more resilient way," said CNE's Soto-Class, whose group has been working with P.E.C.E.S. delivering water and supplies in Punta Santiago. It's a tough road ahead. Puerto Rico has been reeling from a decade-long economic crisis. Although Congress passed a law, known as PROMESA, to repay its more than $72 billion debt, it did little to reform the government, to start upgrading the electrical system or to stimulate economic growth for the island. For now, like so many others in Humacao, Dalmau dreams of a "normal life." He said he looks forward to the day when the power returns, he can pour ice from his freezer, and sing the classic Rubén Blades song "Pedro Navaja" while standing under a hot shower for an hour. Asked how he can be hopeful amid the despair, Dalmau recalled a period in the island's history when thousands died over two years from an epidemic that hit the island. "If from an epidemic like that, where 100,000 Puerto Ricans died, we were able to rise up, why wouldn't we rise from Maria?" he asked. "Claro que nos vamos a levantar!" "Of course we will rise up." Additional reporting by NBC contributor Istra Pacheco.